July KT Key is HERE! July’s K-T Key is here! Remember to send me some feedback on what I could add or change. Suggestions are always welcome! International Convention was a blast, just had to get that out there! All of you key clubbers should definitely come next year, it’s truly amazing to get to meet people from other districts! 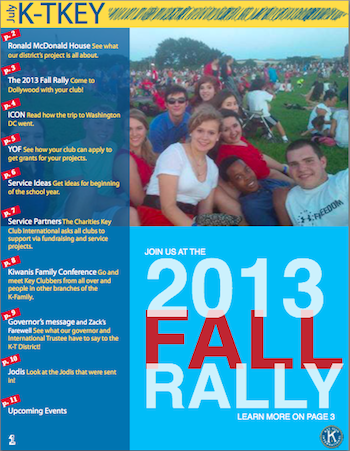 Anyway, this issue of the K-T Key focuses on our district project, Fall Rally, ICON, the Youth Opportunities Fund, service ideas for getting back to school, and the Kiwanis Family Conference in November, so check it out!